Using size 3 needles, cast on 128 stitches using thumb cast on. Change to size 6 needle. Repeat these two rows for stockinette stitch. Repeat pattern rows until measures 3 inches. End on ws row. Using size 3 dpn needles, cast on 40 st using thumb cast-on. Rows 1: *Knit 5, m1*, repeat to end of round. Knit in pattern to two sts before marker, *K2tog, slip marker, ssk*, repeat for other three markers, k to end. Repeat these two rows in pattern until there are 24 stitches between shoulder markers ending on ws row. Shape neck row: Bind off 4 st at beginning of next two rows continuing with arm decreases and pattern. Next row: ssk, continue with arm decreases in pattern to last two st, k2tog. Repeat these two rows until there are 11 st left at sleeve. Graft the stitches under the arm using kitchener stitch or your favorite stitch. Neck band: Pick up 79 sts around front left, sleeve, back, and right front. Knit 6 rows. Right front band: Pick up 4 st at bottom edge, 38 stitches along right front edge, and 4 st at top edge, (46 st total). Knit two rows. Buttonhole row: Row 3: k3, k2tog, yo, k 10, k2tog, yo k to end. Left front band: Repeat for left front side eliminating buttonholes. Weave in ends. Block to measurements. Sew buttons on corresponding side at buttonholes. Darling sweater. Thank you for the free pattern. Really cute sweater!!! Thanks for sharing! This is a beautiful sweater. I have a great neice, she’s 2 months old. I’m going to make this for her. It should fit her for the summer when we have a cool night or something. Thanks for sharing it. I LOVE this pattern. I am now working on a second one for my daughter in a new color. I use fuzzy yarn mixed in and it makes such a posh piece. People don’t even believe I made it! The next one I make will be in a size for me ;-). THANK-YOU for sharing!!!!!! I appreciate your coment. Thank you. I’d love to see pictures of your sweaters. There is an error with the stitch count. I believe it should be 200 stitches. Four stitches from the body of the sweater for each sleeve goes on waste yarn and four stitches from each sleeve goes on waste yarn. Those eight stitches will be woven together. When adding the sleeves, it is hard for the first couple of rows. I actually used a combination of straight needles, double point needles and circular needles. Once you get a few rows into it, it’s a lot easier with just a pair or straight needles. I really need to update this pattern with the corrections. Cant wait to try this, thank you…. Hi! Just wondering how to make this larger? I’m looking to make one for a 3 year old 🙂 thanks! This was my very first pattern and I didn’t know what I was doing so I have no other sizes available right now. There are also some errors in the pattern that I need to correct. Stitch counts are off at the sleeve divide. Go up a needle size or two and see if that would help. 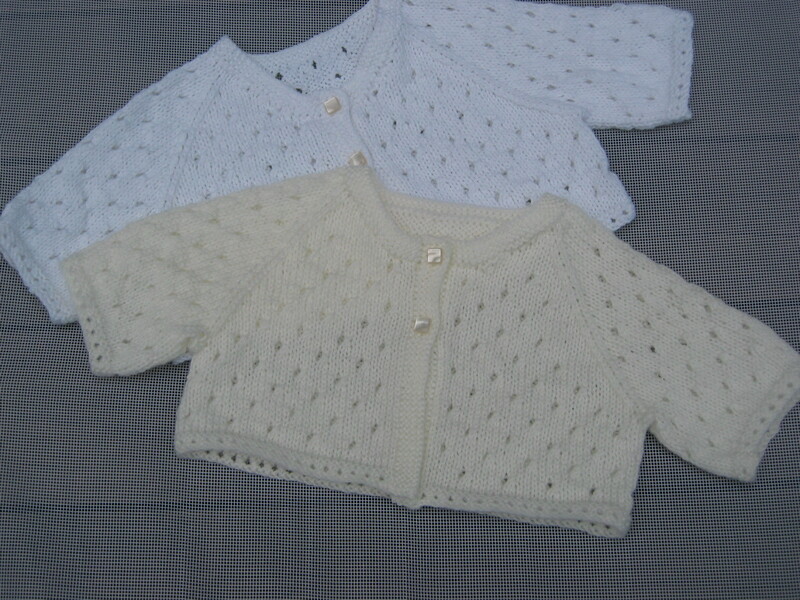 I made these for my granddaughters and the sweaters were still too big for them when they were 2. Sorry I’m not much help and it’s my pattern! I was very interested in this pattern untill I read all the comments; not wanting to deal with errors unfortunately..however when the corrections are made I would love to make this!